9 Web Conferencing Platforms for Education and Collaboration 2.0: What Should Your Organization Use? This blog post was updated as of November 2014 to reflect the advances of each web conferencing platform since the original blog post was published by TJ Thomander. Have you ever been in a classroom and had the teacher ask, “If you can hear me please click on the smiley face?” If so, you have experienced education 2.0—impersonal yet far-reaching and convenient. There are several web conferencing platforms that allow organizations flexibility in the way they learn and collaborate, and there are many options available. We want to break down the top nine that we feel are the most competitive in the space right now. We’ve updated this post to describe how these web conferencing platforms have evolved over the last few years since we first published this post in 2011, both in terms of functionality and pricing. Web conferencing has a plethora of uses, whether for teaching or tutoring, collaborating on projects in real time, or holding a webinar that allows participants to interact with each other. The basic features that you can expect from a web conferencing platform are the ability to upload and display a presentations, documents, or other media; a chat function; and a white board. At the time of the original blog post, Google+ Hangouts didn’t quite offer these features, but through apps like “Screen Share” and “Scoot and Doodle”, it has become a flexible option for creating and broadcasting online lessons, webinars, and events, or for collaborating with co-workers and classmates. Although a Google+ Hangout is limited to 10 users at a time, anyone can broadcast and record a Hangout using Hangouts on Air. Hangouts on Air enables users to share broadcasts with a wider audience, and allows the audience to watch live and participate by commenting, or to view a recording of the broadcast at any time. With these advantages, we decided to go with embedding Google Hangouts on Air for our own live events on our course platform. Premium web conferencing platforms are delivered by Adobe Connect, Saba, and Cisco WebEx. These platforms are browser-based, and participants are able to connect through VoIP on all three. Additionally, these platforms are generally able to host greater amounts of attendees, and their features are highly customizable, whether an organization seeks to focus on collaboration or learning. This customized functionality comes at a premium, and most often the agreement is negotiated based on the needs of the client. If you work in the ICT4D field, the most important factor to consider among web conferencing platforms is the level of bandwidth necessary to run- and these top-level options won’t be ideal. The ideal option for an organization among the three premium platforms depends on an organization’s priorities. Saba is built to create a rich online learning experience geared toward professional training and development. Since 2011, Saba has adapted its model by creating apps that are specialized for certain HR functions in the workplace. In the realm of online learning, Saba offers “Learning@Work” for organizations to build capacity among employees through online learning options that integrate virtual classrooms, collaborative goal-setting and tracking, and course selections tailored to the interests and goals of employees. Adobe Connect and Cisco WebEx can serve an organization’s web meeting needs, but also offer the option to extend their services to include webinar and event management, as well as features that encourage social learning. For these 3 platforms, an organization is able to purchase various levels of participant limits and customize platform features based on its needs. These web conferencing clients are in a battle royale for low prices, simple aesthetic, and competitive functionality. We’ll be focusing on Fuze Meeting, Vyew, Yugma, GoToWebinar, and Blackboard Collaborate. I want to first discuss my favorite of the bunch—Fuze Meeting, as it offers just about everything that the premium platforms offer. It allows multiple call–in options, video conferencing, the ability to record and download webinars, mobile device integration, and breakout rooms. GoToWebinar and Yugma both offer similar features at a higher price point, but do not include breakout rooms. Vyew is ideal for web conferencing among a smaller number of participants, and is available at varying price points for a maximum of 15 simultaneous participants. For 5 participants, it offers video conferencing (but not much else) for a mere $9.95/month. Big Blue Button is an open-source platform geared towards educational institutions. It can be modified to fit the needs of the client, but would require a knowledgeable IT team to do it. It offers the ability to present via video and conference with students, annotate presentations, and has been updated to include the ability to record sessions and view them at any time. It still lacks mobile integration, but continues to be updated, and is highly recommended for organizations that have a good handle on tech and want a cost-effective and easy-to-use option. We have heard nothing but good things about Fuze Meeting, and even recommended that one of our clients make a switch from Elluminate. Fuze Meeting better suited their needs for organizational conferencing. Their international staff members are now able to call in via Skype, a separate VoIP number, or via telephone, and this flexibility is important if firewalls block certain types of online communication. Additionally, Fuze’s mobile device add-ons have helped their employees communicate on-the-go. We are excited to see how further innovations in online learning can continue to improve student learning outcomes and give people everywhere the ability to collaborate on solutions to complex challenges across the globe. 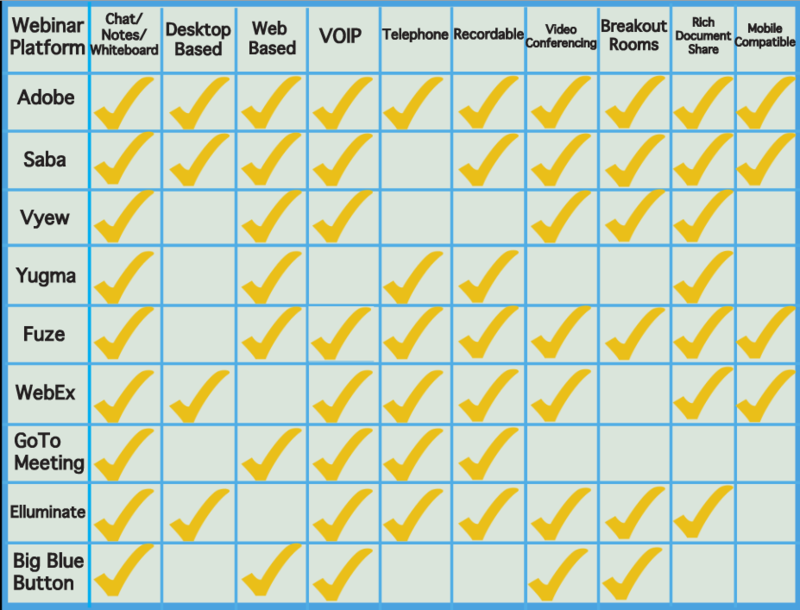 Have you used any of these web conferencing platforms? If so, what you what did you think about the experience? Are there any new and exciting platforms that we missed? Interested in how TechChange integrates web conferencing in our online trainings? Join our online courses on technology for social change here. TJ thanks for this great intro. 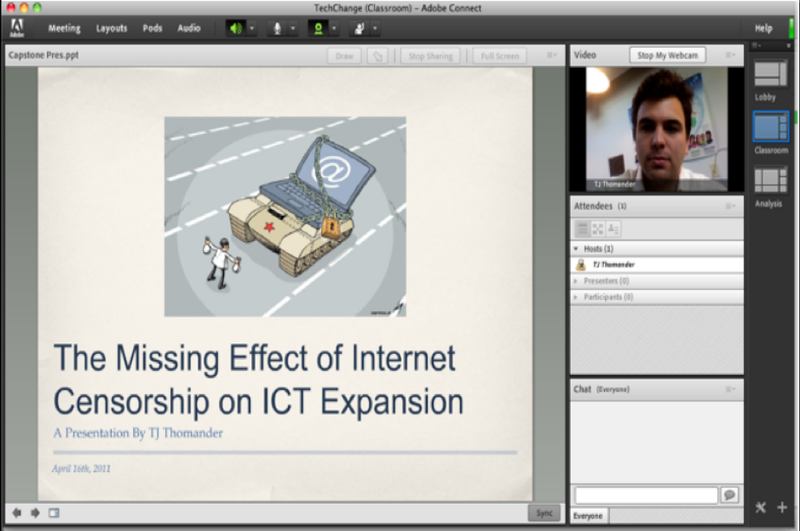 We are just starting to evaluate eConferencing platforms for a new ICT4D venture. We have ruled Elluminate out and would love to use use and support the development of BigBlueButton. As you point out the bandwidth necessary to run the different options is key in ICT4D. In your article you rule out the top-level options on this basis but you didn't say which options operated best a low-bandwidth? Based on your research, which options would be best for ICT4D in low-bandwidth environments? Thanks for your question Tony. Fuze Meeting recommends that users have a bandwidth speed of 1 Mbps upload, 4 Mbps download for video conferencing. If they only want to join in the audio it would require much less, probably around 10kbps. However, we didn't hear any issues from the organization we work with that has users connecting in low bandwidth areas. Vyew looks to be a great option for low bandwidth, as they recommend an video upload rate of only 60 – 100 kbps for low bandwidth users. Those two seem to be the best to consider. It would have been helpful for a comparison of which of these has clients for Linux. Have you considered non-subscription based service via appliance? RHUB <a href="http://(http://www.rhubcom.com/)” target=”_blank”>(http://www.rhubcom.com/) web conferencing appliance has 6 functions in one box. Wow this looks like a fantastic alternative. I'll read some reviews and see what people think. I am also interested in knowing more about the use of these services in developing countries or in areas with low bandwidth internet… We are currently using Elluminate for large webinars (200+ participants) and Fuze for meetings with 10 or 15 people. Elluminate works well in countries with basic connectivity. We use Fuze when we want to see each other or share multimedia presentations. Hi, I have the same question. What are you using today? Also use Blackboard Collaborate for our low bandwidth connections, although it works well it does have some connectivity issues sometimes. Has anyone come up with alternatives? "GoToWebinar, which does not make much sense as they do not offer video conferencing or…"
Actually, Gotowebinar does include video conferencing. Their current product has HD Faces, which is high-def video conferencing. offer video in future versions. GoToMeeting has video but is limited to 15 attendees. Fuzebox looks great – but its a nightmare! It is the seventh circle of hell dressed up like apple – but its rotten. As for the confusing help desk, tickets and unhelpful support – its a place for masochists. What does TechChange use themselves? Nice article. Education and collaboration can also be done by using various other web conferencing services such as WebEx, gomeetnow, etc. or having on premise web conferencing appliance installed such as RHUB appliances. Deployed BigBlueButton and it is best collaboration suite…. try it for free and customize as you like…. Thank you for this summary. Collaboration can also be done by using various other Conference Call Service such as WebEx, Webex Connect, etc. you might want to take your pick amongst those platforms, depending on which one suits your demands best. If you get them connected to your LMS, such as tcmanager from http://www.softdecc.com you will be able to generate a perfectly designed learners experience for your professional corporate academy.